Thanks to the collaboration of Starline Global Trade Inc., Bösch Boden Spies GMBH and Co. KG, Noberasco SPA, Tomra Sorting Solutions, Campos Brothers Farms, John B. Sanfilippo and Son, Inc., MWT Foods, QiaQia Food Co. Ltd., Setton Pistachio of Terra Bella, Inc., ShoEi Foods Corporation, Samsons Traders and CWS Ingredients, the campaign has turned its mission into reality. With the €47,800, Save the Children could provide 2,041 children from Mauritania, South Sudan and Bangladesh, a monthly supply of nutritional packs. The INC and Save the Children join forces to fight child malnutrition. 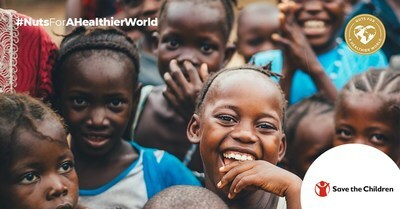 Since January, €47,800 has been raised for the international NGO Save the Children through Nuts for a Healthier World Campaign. INC International Nut and Dried Fruit Council’s global campaign has exceeded the initial €40,000 goal. With this achievement, Save the Children can provide a monthly supply of nutritional packs to more than 2,041 severely malnourished children from Mauritania, South Sudan and Bangladesh. Since the partnership with Save the Children boosted the fundraiser, companies such as Starline Global Trade Inc., Bösch Boden Spies GMBH and Co. KG, Noberasco SPA, Tomra Sorting Solutions, Campos Brothers Farms, John B. Sanfilippo and Son, Inc., MWT Foods, QiaQia Food Co. Ltd., Setton Pistachio of Terra Bella, Inc., ShoEi Foods Corporation, Samsons Traders and CWS Ingredients, have become the cause’s most prominent flag-bearers. Goretti Guasch, INC Executive Director, has expressed: "I am delighted to see the nut and dried fruit industry come together again to support such an important cause." As for Save the Children’s Director of International Cooperation and Humanitarian Action, David del Campo, "Nuts have much to offer in most situations of malnutrition and this campaign has helped us to ensure that pregnant women and young children have access to an accurate treatment."